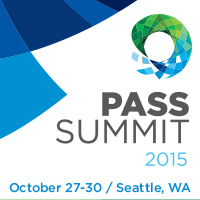 PASS Summit Key note is off the ground and running…..
President Thomas LaRock talks about the 16th annual meeting that is taking place and the #sqlfamily. This event is really like a family reunion with over 58 countries and 2,000 companies that are here to get this party started. One of the points Thomas made that I found it to be really good is that PASS needs to hear from you and wants to hear from you; that is part of being a family. Data professionals have a desire to grow and build out your professional network, because of that be that voice; be the difference maker. Being part of PASS; things are rapidly changing; providing thoughts of where you came from and where we will be in 15 years. One reason for this, and a great point, is the community and the countless of volunteers. Consistently looking at ways to help others is what has made this community great and securing the future for additional growth and members as we move forward. Amazes me the sponsors that help make the community events take place; big applause should be directed to them and as you go through week talk to them; thank them, and yes as Thomas said, you can hug them IT IS OK!!! This entry was posted in Uncategorized and tagged SQLServer by Chris Yates. Bookmark the permalink.